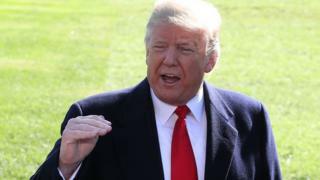 US President Donald Trump has warned that the United States intended to build up its arsenal of nuclear weapons to put pressure on Russia and China. Speaking to reporters, he repeated his contention that Russia had violated the 1987 Intermediate-Range Nuclear Forces (INF) treaty, which he has threatened to abandon. Mr Trump said the US would build up its arsenal “until people come to their senses”. Meanwhile, US National Security Adviser John Bolton has been holding talks in Moscow after Russia condemned the US plan to quit the deal. Mr Bolton was told that the US withdrawal would be a “serious blow” to the non-proliferation regime. However, Russia’s Security Council Secretary Nikolai Patrushev also said the Kremlin was “ready” to work with the US to remove “mutual” grievances over the INF. Is this back to a nuclear arms race? As Mr Bolton began his visit, Moscow warned it would take steps to maintain the balance of nuclear power. What did the treaty do? The INF treaty was signed by US President Ronald Reagan and Mikhail Gorbachev, the last Soviet leader, in the final years of the Cold War. It banned ground-launched medium-range missiles, with a range of between 500 and 5,500km (310-3,400 miles), both nuclear and conventional. On Sunday, one of the original signatories of the INF treaty, Mikhail Gorbachev, said a US withdrawal would reverse efforts made to achieve nuclear disarmament. But the US insists the Russians have, in breach of the deal, developed a new medium-range missile called the Novator 9M729 – known to Nato as the SSC-8. It would enable Russia to launch a nuclear strike at Nato countries at very short notice. Withdrawal from the treaty is also seen as a counter-move to China, which has not signed up to the deal and can therefore develop such weapons at will.